Illustration by Cristina Rosique, student on MA Graphic Media Design, London College of Communication, class of 2018. There is a story by Italo Calvino, The Baron in the Trees (1959), where a young Italian nobleman of the eighteenth-century rebels against his parents by climbing into the trees and remaining there for the rest of his life. After he has lived in the trees for a while, they become, ‘… hung all over with scrawled pieces of paper and bits of cardboard … with various objects; clusters of feathers, church candles, crowns of leaves… pistols, scales, tied to each other in certain order… served to jog his memory and make him realize that even the most uncommon ideas could be right.’ (Calvino, 1959, p.255). This issue of Spark brings together an assemblage of provocative articles that have been a delight to read. Encountering these texts has led to me think about how we can come become even more thoughtful learners and teachers at UAL. What they all have in common is that they are uncommon. They are imaginative and creative thought experiments that deterritorialise our pedagogic practices (Nadler, 2015), and open up more spaces to help us become critical designers of our curricula and pedagogies. They help enliven the methods by which we can co-produce the ways and means our courses can be delivered. …call for teachers to embrace creative and low-tech approaches to education that celebrate experiences that enrich the well-being and learning of students and staff alike […] education at its best can be simple, engaging and arboreal. Provoked, I imagined a creative university of the future that has a forest as studio where we could book a branch for one-to-one tutorials, a tree for peer-to-peer learning, a copse for taking theory into practice and the arboretum for guest lectures. It is this sort of imaginative critical thinking that will help us create spaces for teaching and learning that are not based on classrooms of the 1850s, but suitable for the 2050s. 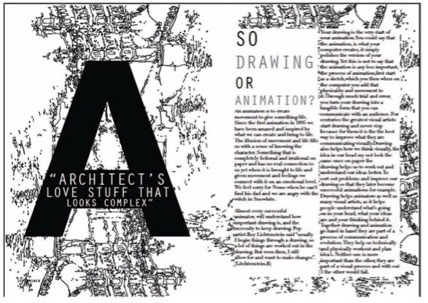 Francisco Gaspar in his article,‘Verfremdungseffekt: Towards a critical Graphic Design education’, asks us if Graphic Design can be epic, more critical and dehabitualised, in order to question the assumptions about how we teach and learn in, with and about Graphic Design. In this thoughtful piece of writing Gaspar asks us not to do away with what we have already got, but to re-imagine the university as a site of critical engagement and resistance so we produce work that question the normative and help us make our world a better place to be. Through the idea of the Brechtian “defamiliarisation effect” Gaspar takes us on a journey back to the future, where he cleverly shows us that we already have the necessary critical tool kits in our universities to create academies that question the given and posit affective ideas and “things”. Eleanor Dare, whilst the Technology-Enhanced Learning Coordinator at LCC, always kept my thinking about pedagogy from becoming lazy and falling into self-set traps, by questioning what may have looked on the surface like shiny, new teaching and learning ideas, which on closer inspection often turned out to be no more than false assumptions built on top of raggedy, worn out, old assumptions. In her provocation piece, ‘Out of the Humanist Matrix: Learning taxonomies beyond Bloom’, Dare challenges us to question long-held notions of where we get our ideas of best pedagogic practice from. Her article rips up the ground upon which we have constructed the digital in our programmes of study. By destabilising oft-cherished ideas Eleanor helps us become more ‘disruptive thinker[s]’ (Zweibleson, 2017 in Dare, 2018, p.49) about our pedagogy. As students from different cultures meet and are exposed to a variety of ideas, there will always be new information shared and new perspectives gained. It is hoped that this interaction will help students develop more intercultural awareness and send them on their way to become global citizens. Neil Drabble’s research paper, ‘It’s all about ‘me’, with you: Exploring auto-ethnographic methodology’resonated when he described his conversational approach. Neil’s research allowed him to use auto-ethnographic approaches and to amalgamate his collection of dialogues into a playful fictional form of storytelling. They represent philosophical thought experiments and fictive narrative philosophy. For me, his imagined conversations about pedagogical practices open up critical thinking about thinking. One way to start a conversation is to see it as a way knowledge can be exchanged. We often forget to ask, “what can you teach me?”, rather than “this is what I am going to teach you”. In the case study, ‘SAKE: Student-led, skills-based workshops to support inclusivity within the creative curriculum’,Michelle Wild shows us that, ‘peer learning brought people together, developed a sense of community and built positive communications’ (Wild, 2018, p.37). The Skills and Knowledge Exchange workshops that Michelle describe in this article acknowledge that students bring with them to university particular knowledge and understanding that if facilitated skilfully in peer-to-peer learning environments, can add to the plurality of a group’s thinking about a subject. It is about breaking a habit and being open to experiments… If you walk the same route every day from home to work, you just switch off and you don’t look anymore because you’ve seen everything. But if you just make an effort of going in different route everyday, you will experience the world very differently. And I think you can translate that kind of experience to a way of living: be open, try different things, don’t just get stuck in one way, in the system… It is about challenging yourself and becoming consciously aware of how you engage differently with spaces. Ngọc argues that, ‘psychogeography practice is an act of acceptance, a way of befriending the uncertainty and embracing the beauty of everyday knowns and unknowns.’ (Triệu, 2018, p.62). In his mixed media case study submission, ‘‘On the spectrum’ within art and design academic practice’, Luca Damiani gives us his video ‘My Aspie Hacks the Brain’, which he describes as, ‘Attempting to represent my neurological flow, the video explores my relationship to my surroundings and the way I process phenomena internally’. Luca by sharing with us, ‘…the idea of being neurodivergent within a creative academic environment’ helps ‘create an engagement at all levels of academic practice bringing qualities and abilities into the surface, and opening diverse conversations on the topic, looking at the potential of an inclusive society’. He makes us aware that the strength of any organisation is its ability to be diverse and to recognise diversity as a critically creative way to understand how to construct radical pedagogies. As the guest editor of this issue of Spark and editorial board member I believe that one of its functions is to frame and lead the debates in the thinking and practice of creative higher education teaching and learning. This issue in an exemplar of how we can open up the multiple ‘pockets of good practice’ (Orr, 2016, p.1) we have at UAL, showing us how we can start to sew them together for the benefit of all our staff and students. Calvino, I. (1959/2017) The baron in the trees. New York: Mariner Books. Lange, S., Reynolds, R. and White, D. (2016) ‘A journey around my classroom: The psychogeography of learning spaces’, Spark: UAL Creative Teaching and Learning Journal, 1(2), pp.122–129. Available at: https://sparkjournal.arts.ac.uk/index.php/spark/article/view/25 (Accessed: 21 January 2018). Orr, S. (2016) ‘Preface’, Spark: UAL Creative Teaching and Learning Journal, 1(1), p.1. Available at: https://sparkjournal.arts.ac.uk/index.php/spark/article/view/7/11 (Accessed: 14 January 2018). Tarantino, Q. (1999) Pulp Fiction: Screenplay. London: Faber & Faber. Dr Mark Ingham is a Senior Lecturer and UAL Teaching Scholar in the Design School at London College of Communication. For the last two years Mark has been an acting Programme Director for Contextual and Theoretical Studies, Spatial Design Communication, Branding Design Innovation and most recently Graphic Design Communication. His pedagogical and creative research are entangled encounters with: images of thought and memory, rhizomatic and meta-cognitive learning theories, fuzzy narratives and virtual and physical liminal teaching spaces. Inside, in between and out: How can psychogeography be beneficial to teaching and learning in higher education? Reflective commentary on my educational roles and experiences. In this application for a Senior Fellowship of the HEA I aim to show that in my professional teaching practices over the last 25 years I have constructed new learning and teaching spaces that have challenged and developed the pedagogical processes used by the organisations I have worked for. From making contemporary art practices the focus of art and design curriculum development at the Institute of Education (Macleod 2013), to the introduction of mobile technologies as a teaching and learning tool at LCC (Beetham & Sharpe 2013), I have always wanted to do more than just teach. During my time as an educator/practitioner I have mentored a large number of teachers and tutors and helped them think more meticulously, rigorously and imaginatively about their own teaching practices. To make this happen successfully, I have modelled effective teaching methods and helped lecturers engage in critical pedagogical thinking Central to this application is the idea of the ‘professional practitioner’ as both an artist and teacher and how this benefits the leaner’s experiences of pedagogy (Clews 2010) and as Gilles Deleuze once argued, ‘No theory can develop without eventually encountering a wall, and practice is necessary for piercing this wall’ (Deleuze cited? in Foucault 1980: 206). As Mark Connell (2008) argues in his article, From Shame to Joy: Deriving a Pedagogical Approach from Gilles Deleuze, and as I have tried to develop in my teaching practices, ‘In relation to actual practice, the ethical demands of “teaching” require that all of the potentials of education are explored and conversely, the well-worn paths of traditional practice are viewed with scepticism. This reveals the nomadic character of becoming teacher. It is an awareness of limits and a movement around them. It is a desire to create.’ (Connell 2008:9). Educational philosophers, Inna Semetsky and Diana Masny in their book Deleuze and Education (2013) note that, ‘As Deleuze and Guattari wrote: “If the three ages of the concept are the encyclopaedia, pedagogy, and the commercial professional training, only the second can keep us from falling from the height of the first into the disaster of the third” (1994: 12)’, and go onto explain that, ‘The unpredictable and unforeseen connections presuppose not the transmission of the same but the creation of the different; this is the process that has important implications for education as a developing practice of the generation of new knowledge, values and meanings’ (2013: 2). My encounters with the ideas of Gilles Deleuze and Felix Guattari in developing my art practice and more recently my thinking about pedagogy and how it is practised in Art and Design Higher Educational environments has led to a number of interventions into to the way I have taught students. Central to my thinking has been the Deleuzoguattarian concept of the ‘Rhizome’, which appears in the introduction to the second volume of their work Capitalism and Schizophrenia, A Thousand Plateaus, first published in 1980. 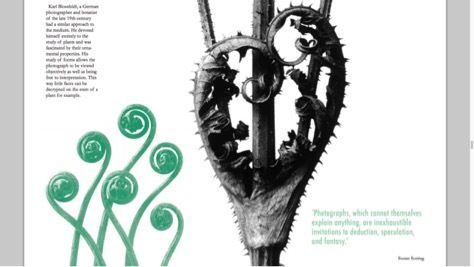 They use the concept of the rhizome in an attempt to break away from an ‘image of thought’ being rooted in the idea that knowledge has a tree like structure. In their many explanations of how rhizomatic thinking might work they argue that, ‘The tree articulates and hierarchizes tracings; tracings are like the leaves of a tree. The rhizome is altogether different, a map and not a tracing. Make a map, not a tracing. The orchid does not reproduce the tracing of the wasp; it forms a map with the wasp, in a rhizome.” (1987:12). The concept of the rhizome and other ideas from the philosophical writings of Deleuze and Guattari have recently been used in a growing number of pedagogically studies and are being used in curriculum developments around the world in multiple educational settings. My hope is that my two case studies can be seen as a small contribution to how these Deleuzoguattarian ideas can be used to benefit art and design students studying in UK HEIs today and in the future. In his opening remarks entitled The Paradox of a Book, Nicholas Negroponte, the former head of MIT, famously introduces us to his work Being Digital (1995) by writing, ‘Being dyslexic, I don't like to read’ (Negroponte 1995:3). If I was to write a book about the fluid world of art and design higher education today, I might possibly introduce myself by saying, ‘Being dyslexic, I love to read, but find writing a stumbling and stuttering process, but highly rewarding.’ It is the power of writing, writing with theory and with research in combination with a students’ art and design practice, that has driven my pedagogical thinking and practice over the past three decades of teaching and learning in art and design institutions. As a practising artist who teaches, I have always encouraged those I work with to use both their thinking practices, and doing processes, to produce the most effective art and design they can (Elkins 2013). Through my teaching career I have moved from working, almost exclusively, on a one-to-one, studio based pedagogy, to Programme Leader, and now to my current role as a Co-ordinator delivering all theoretical aspects of art and design to large cohorts of students. My educational art and design journey has taken me from the exclusivity of going to ‘university’ in the late 70s as a student to teaching in the much more inclusive universities of the 21st century and my thinking about education has become all the better for this change. Because of these experiences I believe in high quality mass education and aspire to getting as many students to continue learning for as long, and as often, as they wish. To achieve this I have constantly tried to improve the quality of my teaching through numerous CPD and other educational courses. (See Appendix 2 for more detailed Curriculum Vitae.) When I first started teaching in art schools and colleges it was by using models I had myself been taught by, which were using individual and group tutorials and occasionally the group crit. Although I had been ‘taught’ by a number of world famous artists, including Antony Caro and Richard Deacon, whose styles ranged from the verbose to the morose without much in between, I always felt I learnt very little about teaching from them. What I gained from these experiences was to learn not to teach like them. However, this did not then stop me talking too much when I nervously gave my first studio tutorial. This is what I call the too-much-talking-phase of my pedagogical career, which can still manifest itself today and was only put under scrutiny when I started to listen to ideas about how students learn during my full-time PGCE at the Institute of Education. The realisation that I needed to know more about how to teach and how we learn, came during my fifth or sixth ‘artist in schools’ residency in the late 1980s, when it dawned on me that I knew practically nothing about the job I was being paid to do. This led to my decision to apply for an Art and Design PGCE. At the time they offered a combined Secondary and Post Compulsory route, which gave the opportunity to work in Schools and FE/HE Colleges sectors. I took this route and it has affected all of my teaching and learning practices since. The curriculum and the staff at Institute of Education challenged all my preconceptions about education. This gave me the practical and theoretical framework from which I could critically engage with all aspects of education from Nursery School to Doctoral Studies and beyond. I attempted to challenge the over historically-based nature of the way art and design education was being taught at the Institute of Education. Rather than starting with art of the past, my whole teaching practice was based around using contemporary art and design practices, using artists and designers as starting points for the leaners to engage with their own nascent art and design practices. British contemporary art at the time was vibrant, exciting, socially engaged, and I found could be easily connected to the lives of the learners I was working with. Many of the artists and designers making work at the time were from the same places and backgrounds as the students I taught and therefore they did not seem remote, or their work obscure. Art Galleries, museums and studios were at the heart of all my teaching, as it is today (Pope 1978). I also realised that to be able to engage the students more I had to listen to their voices. I went from the idea that they were ‘empty vessels’ waiting to be filled with knowledge, to using their experiences as starting points for a more nuanced pedagogy (Freire 1996), (Giroux 2003), (Schon 1985). Since completing the PGCE in 1980 I have continued to be invited to participate in Artist Residencies, whilst continuing my professional practice as an artist. I have also had a number of posts working in Art Galleries, FE Colleges, Universities at BA, MA and PhD levels and at present have three External Examiner positions for BA Design, BA Animation and BA Dissertations, both here in the UK, and at the National College of Art and Design in Dublin. In all of these roles I have been able to influence the way art and design has been taught, assessed and the curriculum thought about, so that learners’ experiences are of the highest quality. I have validated, written and re-written a number of courses and units, all with the aim to make art and design more inclusive and more challenging. I have also written a framework for an MA art and design programme of study, which aims to integrate online learning with more traditional studio based learn environments (Kalay 2004). After going through the phases of talking less and listening more I realised I needed to think more about my own practice as an artist and, as a consequence, the relationships between professionally practising art and design and teaching it to the highest level possible. This led me to apply for a practice-based PhD in the Visual Arts Department at Goldsmiths. After being awarded an AHRB full-time grant I gave up my part-time jobs in FE and concentrated exclusively on making and thinking about Art. Rather than diminish my engagement with teaching my PhD made me think even more about the importance of effective practices in teaching, research and making art and design. Having led and administered a number of departments and programmes of study over the last 25 years I have been able to effectively manage and deliver the many complex relationships that are involved in these types of posts. At the Whitechapel Art Gallery I liaised with a number of commercial and public bodies, including Tower Hamlets Council, the City of London, the Henry Moore Foundation and the Arts Council of England. I helped to develop educational links with these and other organisations for the benefit of the gallery and the local communities. I was a part of a team that generated commercial funding for an Education Room in the gallery and oversaw its development and installation. It was at the Whitechapel that I saw the potential of learning with, and through, art and design objects. This type of object-based learning enabled the participants of all ages and all backgrounds to engage in non-judgemental discursive spaces, where the objects on show in the gallery were the starting point for thinking and making. As Dr Chiara Ambrosio who developed Object Based Learning at UCL, argues, ‘…the engagement that students have with the works in the museum space is extremely valuable – as it develops their skills of critical appraisal and their ability to form independent judgements about visual sources (Durbin, Morris & Wilkinson 1990). During my four years as an Education Officer at the gallery I radically changed the way workshops were taught and designed by the artist practitioners who ran the sessions. From being a more traditional lecture style event, I managed to show how, by letting the students’ voices and ideas be paramount in the sessions, that a much more productive process of teaching and learning could occur. I aimed to, ‘…locate learners as active makers of meaning, rather than passive recipients of “objective” knowledge. …[and] encourage learners to actively question and embark on a process of enquiry’ (Pringle 2009). The enhancement and sharing of high quality teaching has always been key to the success of any department I have been involved in. Enabling lecturers to develop their teaching has been core to my thinking in advancing the student experience. By managing the curriculum, and the programme design effectively and thoughtfully I believe good practice can flourish. My experiences in this field of pedagogical design have helped students and lecturers alike to become more effective teachers and learners. There follows some examples of how I achieved this. As the Masters Programme Leader at the University of Greenwich I actively participated in developing networks inside and outside the School of Architecture Design & Construction, from the modern communication guru Howard Rheingold on the West Coast to John Madea on the East coast of the USA. Here I developed connectivist ideas of education (Siemens 2004) and started to use a more Deleuzoguattarian approach to curriculum development (Roy 2003, Wallin 2010). To help me understand some of the new developments that were occurring at the time I participated in a number of MOOCs and online courses. In 2011 I joined in with the Change MOOC (#change11) facilitated by Dave Cormier, George Siemens and Stephen Downes. This became a very useful experience albeit showing the power, potential and pitfalls of such massive courses. I also took the 2012 CS101, Introduction to Computing Principles online course run by Stanford University. This helped me understand how courses and course materials can be used outside of a traditional HE classroom curriculum. 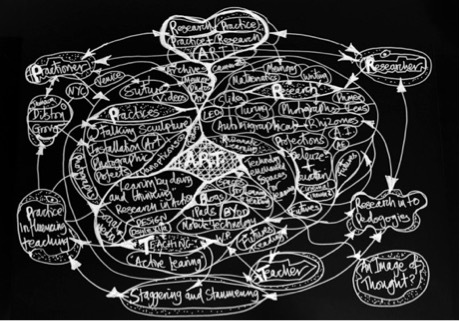 Fig 1: “Becoming ‘Even More’ Rhizomatic” 2015 Three ‘practices Art Research Teaching | Mark Ingham The diagram above (Fig 1) is an attempt to reflect the three elements of my ‘practices’ that directly and indirectly inform my teaching and learning. It shows the overlap of concerns among three different areas of my practices. The first represents the interests of the practitioner and my art practices. The second represents the interest of the researcher, in terms of art, design, theory and pedagogy. The third is the area of interest of the teacher as practitioner. For me it shows that it is the ‘connectedness’ of all the activities that help each one become more than just the sum of the parts. My teaching is critically informed by my practices and an artist and as a researcher both into pedagogy and the production and consumption of art and design. In 2008, as a senior lecturer at the University of Greenwich in the Design Futures Department, (part of the School of Architecture) I introduced two briefs called ‘Wish You Were Here?’ and ‘GAMSWEN’ for first year BA Graphic Design and 3D Design students. These introduced two key concepts to the course. The first ‘Wish You Were Here?’ introduced the importance of how to ask questions of the texts and subjects being scrutinised. GAMSWEN focused on the role of recording an event, making this a key element to help the understanding of the ideas being expressed in the lectures. The students were asked to think of themselves as ‘investigative journalists’ attending a press conference, writing for a magazine or newspaper, (hence news and mag backwards for the brief’s title). They were asked to write up the lectures into a series of articles, which were then produced as a designed physical publication; a magazine, pamphlet or newspaper. 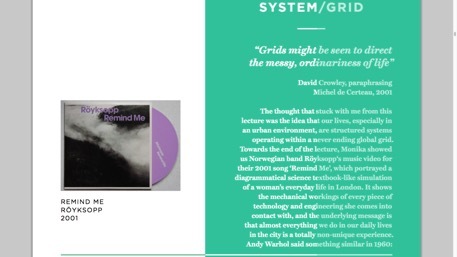 This project formed one element of an article published in the Journal of Writing in Creative Practice, the publication of the Goldsmiths based Writing-PAD (Ingham 2102). An online version can be found at From Wish You Where Here? to GAMSWEN and onto Designed Dissertations: Connecting the design studio with writing in design. 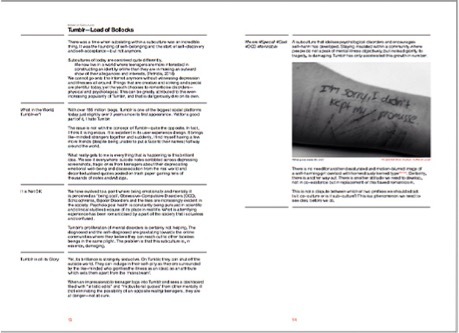 See Case Study 1 for other related curriculum developments and how they improved students’ engagement with writing and researching. At the heart of the curriculum design I have been involved with recently, the idea of entrepreneurship and enterprise has been paramount. This has made me aware of the importance of income generation in terms of research funding and other enterprising methods. The MA programme I helped to design has CPD courses built into its structure so that modules can be taken within the academic framework or delivered separately. I have taught on and developed many short courses over the past 25 years and see this as an exciting and expanding area in which the department can be involved. I have gained a great deal of experience in designing courses and programmes at all levels of Adult, Further and Higher Education from Level 3, Undergraduate to PhD. I have been able to develop and deliver a range of courses and programmes that have successfully pushed students to fulfil their academic and creative potential. See my Case Study 1 for an example of how I have been able to challenge students to go beyond what they think they are cable of. Being a professional practitioner in my creative field, I have been able to model the multiple skills and processes that are key to developing a successful career in the arts. I have administered courses from conception to student completion and been an integral part of validation and review panels at the University and other FE and Higher Educational institutions. Most recently I was the ‘critical friend’ for the new MA/MSc at Ravensbourne where I was the external panel member for the process of validation. By continually developing new ways of assessing students’ work and adhering to the concept that assessment is for learning not necessarily just of learning, I have been able to give effective feedback to all the students I teach. I have been researching and using video feedback to evaluate the impact of this on students’ learning. I have been fully involved in developing assessment procedures and have always looked for ways to feedback to the students punctually and effectively. Fig 2: ‘Ars Magna et Lucia’ by Mark Ingham at Dilston Grove. 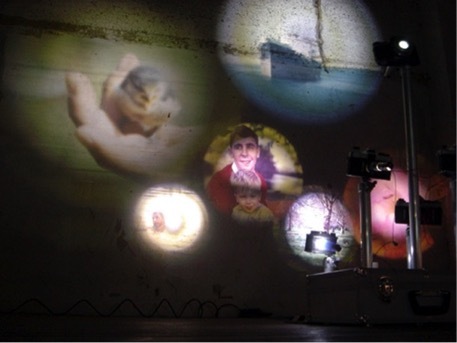 An Installation of 120 SLR cameras made into slide projectors. http://markingham.org/works/ars-magna-lucis-et-umbrae/ As a member of a number of boards and committees at LCC, CAC and the Learning, Teaching & Enhancement Committee (LTEC) and previously at the University of Greenwich, which included the School Board, the VLE group, the e-centre committee, Learning Spaces group, and being on the Compass journal Editorial Board, I believe I have contributed greatly to the enhancement of these institutions. I have undertaken high quality professional research and practice for many years. This includes the aforementioned practice-led PhD at Goldsmiths, which investigated external memory systems and their use in art and design practices. My Post-doctoral research explored the role of the PhD supervisor in practice-led art and design doctoral research programmes at UAL/CLTAD. 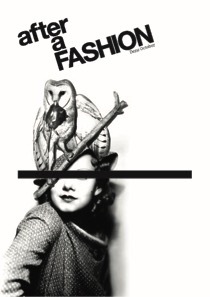 My work was included in the last REF for UAL Wimbledon College of Art. My work has been shown nationally and internationally, most recently in Beijing, Miami and New York. I have been awarded an Arts Council of England individual grant for a solo show at the largest raw installation space in London, Dilston Grove. My work has been recognised internationally and has been include in books and journals, published in London, Helsinki, New York and Miami. Since joining LCC in September 2013 I have continued successfully to design, plan, propose and put into practice a number of learning activities and have continued and hopefully enhanced the good practices that Contextual and Theoretical Studies in the School of Design were already carrying out. With my extensive knowledge of Moodle and other VLEs, blogging and the use of mobile devices I have been able to enhance the learning of the students and have been able to mentor a number of staff in their application of these technologies. This can be seen most clearly in the way a number of staff in CTS at LCC have taken on board the benefits of online presences, for the students to improve their writing skills and to be able to join the work they do in the studio with their theoretical research. This is demonstrated and evidence given in my Case Study 2: Using online presences in teaching and learning as set out below. I have also piloted the use of mini iPads at LCC through a successful research bid. The value of constructive quick, quality feedback has been at the heart of all my teaching. The principles of ‘Assessment for Learning’ models have been key in developing students’ work and engagement with their courses. I have used video and sound based feedback as a way of directly engaging students with informative summative and formative ssessments and I am continuously looking at ways for students to take more control of their learning. The use of ‘blended learning’ has helped me enhance both the physical and virtual spaces today’s students operate in. Whether this is with the extensive use of social media channels such as Twitter, or blogging platforms like Wordpress, the students I teach have gained a much better use and understanding of the affordances and potentials of these technologies for research and for being better connected with the worlds of art and design. To help me, and the colleagues I manage, to use and develop more effective ways of teaching and learning I have continuously sought new methods of enhancing my knowledge of the practical and theoretical advances in art and design pedagogical and curriculum developments. I have taken courses in online teaching and learning technologies and have continued to successfully develop new ways of engaging students in academic writing. Evidence of this is given in my Case Study 1: Continuous and iterative writing throughout Art and Design courses. As a professional practitioner I have kept up to date with the subjects I teach, both in terms of current trends in the disciplines and in the burgeoning theoretical discourses available today. This linked with my continuing research into enhancing effective pedagogical practices has enabled me to contribute successfully to the way students learn and engage with their academic work. I have also been able to help a significant number of teachers and practitioners develop their ability to evaluate their own teaching methods through mentoring them and modelling effective practice. As an External Examiner at three different HEIs and as a member of numerous University committees and validation panels, I have been able to affect strategically the quality teaching and learning of the students at these institutions. For instance at the London Metropolitan University, and at my behest, the BA Design Cluster has implemented a much more rigorous feedback system where all staff now understand the importance of assessment for learning rather that just describing the quality of the work the students have done. I have effectively put into practice a number of high quality well researched pedagogical practices that have fundamentally enhanced students’ learning and experiences of higher education. From before they have started on their university courses, by setting up welcoming online presences, through to enabling them to produce productive and thoughtful dissertations, and final year exhibitions, my ambition for the students I teach and coordinate is for them to be critical thinkers of the highest quality. To achieve these aims I have continually developed my own teaching practices through engagement with CPD courses and have interrogated through scholarly pedagogical research all aspects of teaching and learning. From mentoring over fifty artists during my role as education officer at the Whitechapel Art Gallery to successfully supervising two doctorial students to completing their practice-led/based PhDs, who both now hold substantial teaching positions, I have been able to help many colleagues become better educators over the past 25 years. This has been especially the case of the past 7 years where my roles in education have developed from being purely teaching ones to be ones of coordination and management. I have been able to model best assessment, teaching, research and learning practices to a large number of individual lecturers and have effectively developed teams of colleagues to work better and think better about their own educational practices. Continuous and iterative writing throughout Art and Design courses. Using online presences in teaching and learning. Fig 10.Image used for the ‘Screen Writes’ Symposium held on 27 June at LCC https://screenwrites2014.wordpress.com/ In this case study I look at how I have developed the use of blogs and other online presences to help students develop their writing skills and to make connections with their studio practices. It goes from an engagement with a small cohort of fifty students on a first year unit to the continuing development of the use of these types of connected online learning presences across the 810+ students in the first year in the School of Design at LCC. After I had been using blogs for the dissemination of course materials for a number of years in the mid 2000s and had asked every student to keep one as a way of recording and sharing their ideas, I decided that I needed to learn more about how they could be pedagogically used in art and design HEIs. We were using the VLE WebCT at the time, but were about to move to Moodle where the possibilities of developing online learning had much more potential. The course that was most useful, The Certificated Learning through Transformative Technologies, looked at how to engage with the increasing possibilities of online pedagogies. It helped me realise the even greater potential for these types on online presences to become a connected and integral part of a personal learning network. By using blogs for group work I also found out the power of these types of online presences being used as ‘social learning networks’ outside of the designated curriculum. They took on a life of their own and although still visible to the tutors, they became communal spaces for the exchange of ideas (Gonzalez 2004). This idea of blogs being useful individually and in group work was developed further when I was asked by the Central School of Speech and Drama in London to give a day workshop to 50 first year undergraduate preforming arts students on the possible use of online presences in the development of their reflective journals. To make the session as active as possible and less of a ‘show and tell’ lecture, I constructed a blog that they all became authors of. This meant that they all had access to a single blog as ‘administrators’ and could add, alter and enhance everything about this blog. Rather than, for instance, showing them how ‘widgets’ worked with a Wordpress.com blog in a ‘show and tell’ way, this method allowed for students to quickly learn from each other and to realise the potential of the platform. It also shows very quickly that the blog can be disrupted and even destroyed by anybody in the class. It made the group realise that they all had to be responsible for each other’s work. This approach to learning in a non-hierarchical and decentralised way echoes the Deleuzoguattarian concept of the Rhizome as I have discussed earlier. When they explain the un-centred characteristics of their idea of the rhizome, Deleuze and Guattari argue that, ‘To these centered systems, the authors [themselves] contrast acentered systems, finite networks of automata in which communication runs from any neighbour to any other, the stems or channels do not preexist, and all individuals are interchangeable, defined only by their state at a given moment—such that the local operations are coordinated and the final, global result synchronized without a central agency’ (Deleuze & Guattari 1987:17). This experiment at the Central School of Speech and Drama clearly demonstrates that in a very short period of time a dynamic network of online presences can be set up by a group of students with little or no experience of using these types of platforms. Even more interestingly was the way they started to connect with each other in different and unexpected ways by creating relationships through these new networks could not and would not have happened off line. For me the session was set up so that the teaching was ‘rhizomatic’ which in this case lead to what I would call ‘rhizomatic learning’ (Cormier 2015). Fig 11. Gillian Forsyhe’s drawing of Dave Comrier’s idea of the Rhizomatic. 2013 The session got very heated, in a constructive way, and after only about an hour most of the group had set up their own blogs independently from the original course blog I had set up for them. They had also started to connect their blogs to the course blog and to each other’s very rapidly. This fluid, almost ‘rhizomatic’ way of teaching and learning helped me understand the power of this approach. Along with the students there were a number of staff in the group who by the end of the session were able to take on this way of working online and have now developed it throughout the institution. As Kaustuv Roy (2003) argues in his book, Teachers in Nomadic Spaces, ‘…it seemed to me that the concept of the rhizome is particularly suitable for theorizing the tendencies and potentialities of the narrative and descriptive spaces…. With the possibility of organizing the curriculum in several ways, of initiating new ways of evaluation, as well as in its connection to the field, a rhizomatic description seemed to be a fruitful way of conceptualizing the situation, one that would allow teachers to make new connections’ (p. 88). I have used this method of working with blogs a number of times at LCC and have successfully engaged students and staff in the process of creating and using these types of online presences. It has developed even further and now after only 10 minutes of showing how to set up an email account and the Wordpress.com home page participants are independently using group blogs and individual blogs. Fig 12. 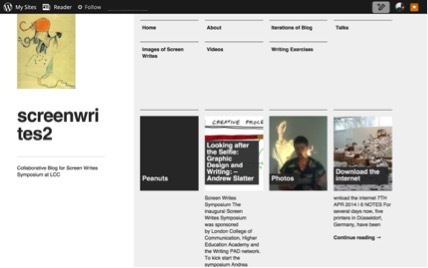 Screen Writes 2 Group blog https://screenwrites2.wordpress.com/ This culminated in using this activity at a symposium I organised at LCC in June 2014 funded by the HEA and Writing-PAD called ‘Screen Writes’. The thirty delegates from universities in the UK and abroad in groups of 3 were each given a mini iPad to create their own group blog. This led to a very dynamic session and many of the delegates went away form the symposium persuaded that blogging could be easy to set up and maintain. One of the ALs at LCC in CTS who was very suspicious of the potential of these sorts of online presences, has now taken up blogging with her first year Contextual and Theoretical Studies BA Illustration students and has had great success in getting the students to write every week about their experiences during these sessions. She is now very enthusiastic about the possibilities of blogs and blogging to enhance students’ learning and especially their writing. She is now seeking further staff development to make the use of blogs in the enhancement of writing for Year 1 art and design students. Fig 13. Screenshot showing active blogs being used at present 2015 Mark Ingham During my time teaching and using blogs and other online presences I have been able to mentor a number of staff who had previously little or no involvement in this types of pedagogical tool. Two of the speakers at the Screen Write Symposium who I line-manage as ALs had never used blogs before in their teaching when they first started at LCC in January 2014. They ran writing workshops for Year 1 design students and when I introduced them to the potential of blogs they took them on board and integrated them into their daily teaching practices. So successful was their development they both applied for, and were accepted to, give a paper at the NAWE - National Association for Writers in Education conference from 14 - 16 November 2014 on the topic of the creative writing together with their nascent experience using online presences. The use of course blogs (Ingham 2012a, 2011b, 2010a) and individual blogs (Ingham 2012c) to gather all their design and writing work into one space has also helped the integration of practice, theory and research (Mason & Rennie. 2008). Their online presences have also helped students write for an audience and use the peer-to-peer opportunities made available by this type of social media (Mason & Rennie. 2008:63). They now write more, on average 4,000 words as opposed to 1,000, and are more analytical, coherent and stylish in their content (Ingham 2012a). Above all the students now enjoy both the act of writing and the processes of getting it to a professional publication standard. Alexenburg, M. (ed). (2008) Educating Artist for the Future: Learning at the Intersections of Art, Science, Technology and Culture. Bristol. Intellect Books. Barnett, R. (2007) A will to learn: Being a student in an age of uncertainty. Maidenhead: Society for Research in Higher Education. Bean, J (2011 ) Engaging Ideas: The Professor's Guide to Integrating Writing, Critical Thinking, and Active Learning in the Classroom. Jossey-Bass Higher and Adult Education. Beetham, H. & Sharpe, R. (2010). 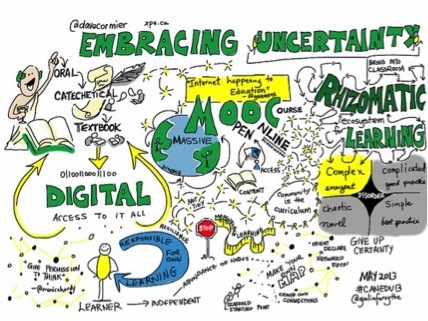 Rethinking pedagogy for a digital age: Designing for 21st century learning. London. Routledge. Biggs, M.A.R. (2004) The role of the artefact in art and design research. Working Papers in Art and Design 3. Accessed May 8, 2015 Bligh, D. A. (2000). What’s the use of lectures. San Francisco: Jossey-Bass. Csikszentmihalyi, M. (2002) Flow: The Psychology of Happiness. Rider Clews, A. & Clews, D, (2010). The Teacher-Practitioner: perspectives on professional development. Artswork. Bath Spa University. http://www.creative-campus.org.uk/uploads/1/0/9/7/10973203/clews.pdf Connell, M. (2008 ) From Shame to Joy: Deriving a Pedagogical Approach from Gilles Deleuze. TPS-OISE, University of Toronto Cormier, D (2015) Dave’s Educational Blog http://davecormier.com/edblog/ (Accessed 25.10.2015) Deleuze, G. & Guattari, F. (1987) A Thousand Plateaus: Capitalism and Schizophrenia. Continuum Impacts http://projectlamar.com/media/A-Thousand-Plateaus.pdf Durbin, G., S. Morris & S. Wilkinson. (1990). Learning from objects: A teachers guide. London: English Heritage. Elkins, J (2012) What Do Artists Know? Penn State Press, Evans, S. & Greenhill, J. & Swenson, I. (1997). Matrix 3d: Sculpture Method Research. (DALI) London. The Lethaby Press. Fink, L.D. (2003). Creating Significant learning Experiences: An Integrated Approach to Designing College Courses. San Francisco. Jossey-Bass Publishers. Foucualt, M. (1980). Language, Counter-memory, Practice: Selected Essays and Interviews by Michel Foucault. USA. Cornell University Press. Francis, P. (2009). Inspiring Writing in Art and Design. Taking a line for a write. Bristol. Intellect Books. Freire, P. (1996) Pedagogy of the Oppressed. Penguin Education. Giroux, H. (2003) Public Pedagogy and the Politics of Resistance: Notes on a critical theory of educational struggle. Educational Philosophy and Theory Volume 35, Issue 1, pages 5–16, January 2003 Gonzalez, C., (2004). The Role of Blended Learning in the World of Technology. from http://www.unt.edu/benchmarks/archives/2004/september04/eis.htm. Accessed 21 April 2015 Ingham, M. (2012). From Wish You Where Here? to GAMSWEN and onto Designed Dissertations: Connecting the design studio with writing in design. Journal of Writing in Creative Practice. Volume 5 Issue 2. November 2012 pp. 301-318 Ingham, M. (2012a), ‘GAMSWEN MAGs’, #GAMSWEN, http://gamswen2012.wordpress.com/gamswen-mags/ Accessed 16 May 2014. Ingham, M. (2012b), ‘Home Page’, #GAMSWEN, <http://gamswen2012.wordpress.com/> Accessed 16 May 2014. Ingham, M. (2012c), ‘Students Blogs, #GAMSWEN, <http://gamswen2012.wordpress.com/students-blogs/> Accessed 16 May 2014. Ingham, M. (2012d), ‘Design Dissertation Preparation 2012’, Design Dissertation 2011/12, <http://dd1112.wordpress.com/about/design-dissertation-preparation-2012/> Accessed 16 May 2014. 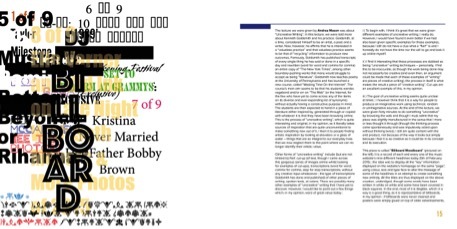 Ingham, M. (2011a), ‘Home Page’, Design Dissertation 2011/12, <http://dd1112.wordpress.com/> Accessed 16 May 2014. Ingham, M. (2011b), ‘Home Page’, GAMSWEN, <http://gamswen.wordpress.com/> Accessed 16 May 2014. 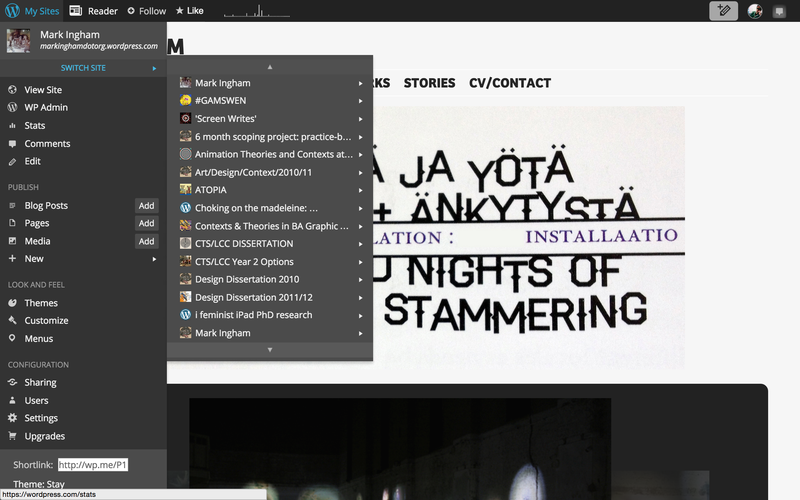 Ingham, M. (2010), ‘Home Page’, Design Dissertation 2010, <http://designdissertation2010.wordpress.com/> Accessed 16 May 2014. 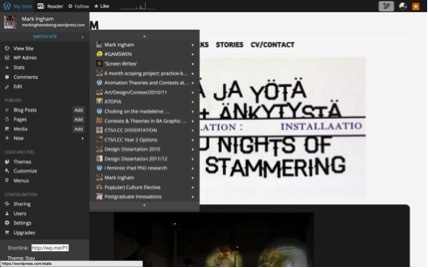 Ingham, M. (2010a), ‘Home Page’, ART/DESIGN/CONTEXT/2010/11, <http://artdesigncontext1011.wordpress.com/> Accessed 16 May 2014. Hart, J. (Author). Walker, S., Ainley, P., McNay, I. & Harrison, W. (eds) (2011). The Learningscape of a virtual design atelier. 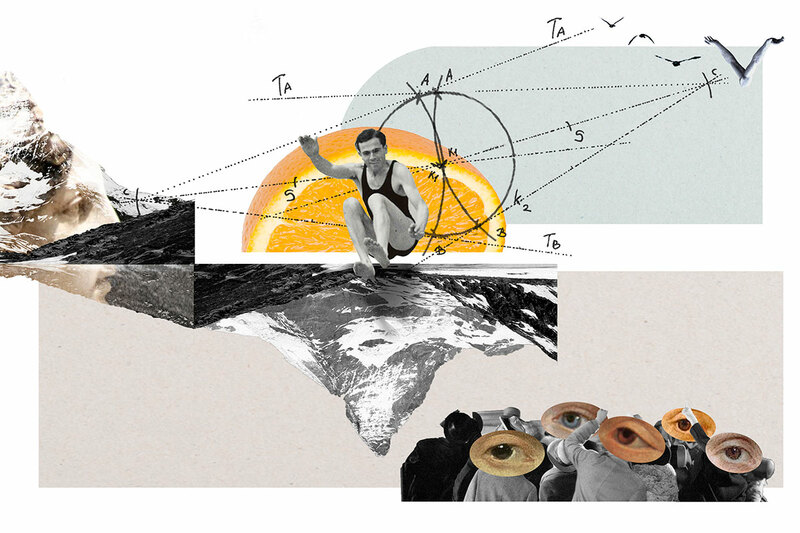 Compass: The Journal of Learning and Teaching at the University of Greenwich. 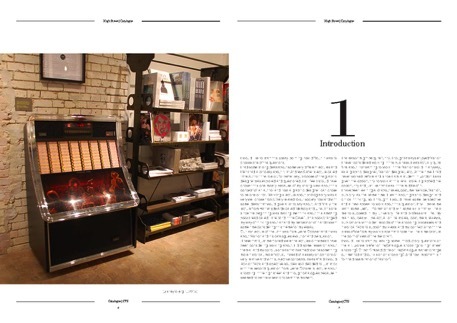 Issue 3, 2011. pp. 35-36 Jackson, N. et al (eds) (2006) Developing Creativity in Higher Education: An Imaginative Curriculum. Routledge JISC (2009). Enhancing learning through technology. A guide to resources provided by the Academy and JISC Collaboration Network. The Higher Education Academy. JISC (2004). Effective Practice with e-Learning: A good practice guide in designing for learning. <http://www.jisc.ac.uk/media/documents/publications/effectivepracticeelearning.pdf> Jones. S. (2006) Antonio Gramsci. London. Routledge Kalay, Y. E. (2004). "Virtual learning environments." ITcon. Special Issue ICT Supported Learning in Architecture and Civil Engineering 9: 195-207. Laurillard, D. (2012). Teaching as a design science: Building pedagogical patterns for leaning and technology. New York. Routledge. Love, K. (2000). Experience: Four Essays on Experience. London. Loose-leaf Marton, F. & Säljö, R. (1976) On qualitative differences in learning. Outcome and Process. British Journal of Educational Psychology 46, pp. 4-11 Mason, R. & Rennie, F. (2008). E-Learning and Social Networking Handbook. London. Routledge. Macleod, K. (2013) Thinking Through Art: Reflections on Art as Research. Routledge Mor, Y., Mellar, H., Warburton, S., & Winters, N. (2014). Introduction: Using Design Patterns to Develop and Share Effective Practice. London. Sense Publishers. Pinker, S. and Mehler, J. (1988). Connections and Symbols, Cambridge MA: MIT Press. Pringle. E. ( 2009) The Artist as Educator: Examining Relationships between Art Practice and Pedagogy in the Gallery Context. Tate Papers Issue 11 Pope, N. (1978) Artist in Schools Project. In Artists in Schools Conference: Whitechapel Art Gallery, 28th April 1978. Whitechapel Art Gallery. Roy, K. (2003). Teachers in Nomadic Spaces: Deleuze and Curriculum. New York, Peter Lang. Schön, D. A. (1987). Educating the Reflective Practitioner: Toward a New Design for Teaching and Learning in the Professions. San Francisco, Jossey-Bass Siemens, G. (2005) Connectivism: A Learning Theory for the Digital Age, elearnspace. http://www.elearnspace.org/Articles/connectivism.htm Accessed 21 April 2015 Siemens, G. (2012) Connectivist Learning Theory, P2P Foundation http://p2pfoundation.net/Connectivist_Learning_Theory_-_Siemens Accessed 11 May 2015 Sullivan, G. (2005) Art Practice as Research. Inquiry in the Visual Arts. London. Sage Thornton, A. (2005). The Artist Teacher as Reflective Practitioner. International Journal of Art & Design Education. Volume 24, Issue 2, pages 166–174. Walker, A. (2009) The Teacher-Practitioner: un-problematic or un-problematised? Artswork. Bath Spa University. Walker, S., Ainley, P., McNay, I. & Harrison, W. (eds) (2011). Food for Thought: Exploring Students’ Perspectives of Assessment and Feedback. Compass: The Journal of Learning and Teaching at the University of Greenwich. 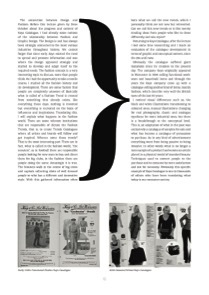 Issue 5, 2012. pp. 15-20. Wallin, J. J. (2010). A Deleuzian Approach to Curriculum. New York. Plagrave Macmillan Ward, M. (2010). Introduction to Curious. Goldsmiths BA Design. Goldsmiths College.